Laser hair removal is the fast and effective removal of hair growth – and is up to 97% effective at drastically reducing the number of hairs in a given area (for the proper skin and hair type). Our Cynosure Elite Aesthetic laser offers two different wavelengths so we can successfully treat darker skin types with ease. Be wary of offices that utilize IPL (Photofacial) lasers for laser hair removal; they are not nearly as effective in the reduction of hair growth and your results can be disappointing. With the Cynosure Elite Aesthetic Laser, our treatments are suitable for all skin types, able to treat the entire body and the treatments are simple and effective! What is laser hair removal used for? Women most often use laser hair removal to treat the legs, bikini line, arms, underarms, upper lip, chin, abdomen, areolas, and more. Men most often seek to remove hair from the chest, abdomen, back, shoulders, neck, beard, sideburns, ears, hands, toes, and more. Ultimately, laser hair removal can be used to permanently remove unwanted hair from nearly any area of the body. Why choose laser hair removal over shaving or waxing? Women and men alike spend a great deal of time and money on removing unwanted hair. While shaving can be time consuming and lead to nicks and cuts, waxing can be painful and cause skin irritation. In addition, both shaving and waxing become a costly expense when you add up the money spent on shaving cream, razors, waxing kits, or professional services over the course of many years. In recent years, more women and men than ever have turned toward the permanent and ultimately less expensive method of laser hair removal to eliminate undesired hair. At CosMedic Skincare, we offer this solution to save our patients both money and time, allowing you to enjoy hair-free skin all year long. For smaller areas of the body – such as the upper lip or underarms – treatments usually last about fifteen minutes. For larger areas of the body – including the chest, back, or legs – treatments usually last about one hour. To maximize your results, our skin care doctor, Dr. Jodie Reinertson, will typically recommend a series of six to eight treatments. During your treatment sessions, a special cooling technique will also be performed to help ensure your comfort. Once the recommended number of treatments has been completed, most individuals experience an 80-90% reduction of unwanted hair. In many cases, results can be seen after just three treatments, and a full series of treatments can often be completed in as few as six months. The total number of required treatments will vary from patient to patient, and, in part, depend upon your hair color, hair type, location of the treatment area, and skin color. During the consultation process, you can be given a more personalized estimate for the number of treatments needed to achieve your goals. Since the Cynosure Elite Aesthetic Laser operates by targeting the hair’s pigment, dark hair can be more effectively treated and eliminated. Patients with blonde, red, grey, or white hair may not be good candidates for laser hair removal. As a result, Dr. Reinertson typically recommends that patients considering laser treatment for hair removal complete all sessions before the hair turns gray or white. Recently I went to visit Dr. Jodie and staffin their BEAUTIFUL location on top of 1st Hill. I had my very first session of laser hair removal. Dr. Jodie and her staff were incredibly friendly and very comfortable; I had no issues with jumping up on the table for the bikini area removal as they were all very professional. After much research on this treatment I also think that the price for laser hair removal seems very reasonable. I will def. be going back to visit and try out many of their treatments. 2 thumbs up!! A good rule of thumb is that if the area to be treated is at the neck line or above, you will need to repeat treatments every 4 to 6 weeks. For areas below the neck line, you will want to repeat treatments every 6 to 8 weeks for best results. Some patients with darker skin types will require additional treatments to see full results. We do not recommend tanning, either by direct sun exposure, sunless tanning lotion or tanning beds, while seeking laser hair removal treatments. Although we can still treat tanned skin, the results are less effective and sensitivity of the treatment will be noticeably stronger. We also recommend that patients avoid retinoid products 7 days prior to scheduled appointments to ensure comfort and safety. At CosMedic Skincare we utilize the Cynosure Elite Aesthetic Laser for our laser hair removal treatments. It is the most comprehensive laser hair removal system available today. It’s designed for all skin types. The Elite removes unwanted hair with unsurpassed efficacy and comfort. That’s because its revolutionary technology combines two optimal wavelengths in one system: the 755-nm Alexandrite laser and the 1064-nm Nd: YAG laser, ensuring both optimal results and safety. What’s more, we are able to administer treatments in significantly less time than with a single-wavelength product. Only about 10% to 20% of the hair in any given area of the body is in the “active” growth phase at any given time. It is during this phase that laser is able to target and effectively deactivate the hair follicle. A visual representation of hair growth is shown to the right. 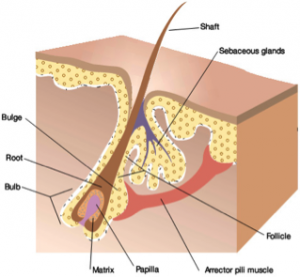 The target of the laser for hair removal is the “bulb” of the follicle. The focused laser energy zeroes in on the dark color of the hair follicle and super-heats it until it alters the follicle beyond repair – thus deactivating the hair follicle and preventing it from regrowing hair in the future. Treatments are spaced 4-8 weeks apart, maximizing the chances of hitting newly active follicles with each treatment. It is because only a certain percentage of hair is available in this growth phase that we need to do multiple treatments spread out over varying time spans to ensure we get the most actively growing hair possible. We endeavor to plan your course of treatments to maximize your results. Individual experience varies, but most people feel a heated sensation like tiny pin pricks, or rubber band snaps. For your added safety and peace of mind, our cooling technology features an advanced patient comfort system, which keeps your skin at a soothing cool temperature during the procedure. We offer this service at no additional cost as a courtesy to our Seattle-based patients. What are the common side effects of laser hair removal? Individuals will have different reactions from treatment based on their unique skin condition. The most common side effects include, but are not limited to: a sunburn sensation on the treated area, post-treatment redness and inflammation, and swelling around the hair follicle. Many of these common side effects reduce within the hour post treatment but some patients may have sensitivity and redness for up to a couple of days after treatment. A full list of potential side effects is available during your consultation. It is important to continue to avoid the sun after treatment as your skin will be sensitive to UV radiation. If you cannot avoid sun exposure we highly recommend using a broad-spectrum UVA/UVB sunscreen that contains both physical and chemical sunscreens. We carry a full line of high-grade sunscreens at CosMedic Skincare to serve a variety of skin conditions and UV protection needs. What is the best way to save money on laser hair removal? The most cost effective way to undergo laser hair removal at CosMedic Skincare is to purchase our Laser Hair Removal Package. By purchasing a series of six sessions at once, you will receive a significant discount compared to paying for each individual treatment as you go. However, for our patients who have begun laser hair removal treatments elsewhere, our a la carte offerings are likely a better option for you. For more detailed information and to schedule a free consultation, please contact our medical staff. For more information about laser hair removal, or to schedule a consultation to determine your candidacy, please contact CosMedic Skincare today.